So finally, after about a week of raining, today the sun came up and shone brightly for a good part of the day. The ground is still wet and muddy, and the streets are still littered with fallen tree branches and dried leaves, but the smell of cool clean air is wonderful. It's so fresh and intoxicating, I just can't get enough of it. This is the kind of day that sparks some creativity in me. A tub of organic raspberries stared at me in the kitchen, waiting to be transformed into something good and a bar of semi-sweet chocolate said, "Me too!" At the same time, I was craving for something sweet and indulgent. A break from our savory soup days. 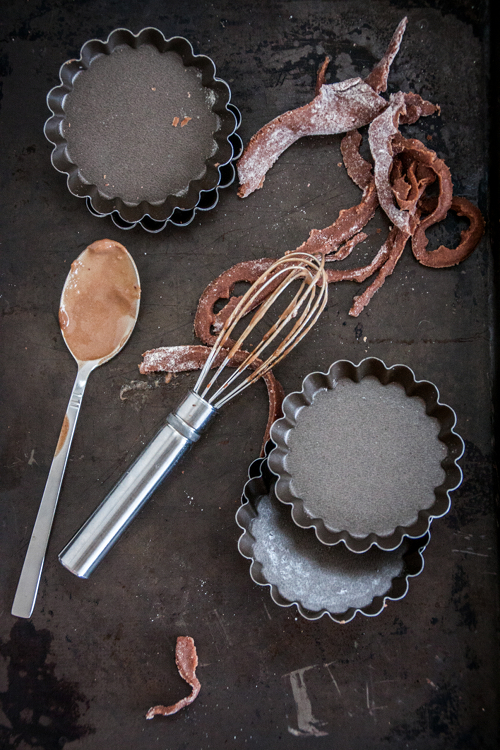 Come on mini pie pans, rolling pin, and pastry bag! Let's get busy and make delicious things happen! To make the shell: Pulse flour, cocoa powder, sugar, and salt in a food processor. Scatter butter pieces in the bowl of food processor and pulse until the mixture resembles coarse cornmeal, about the size of a pea. Add egg into the mixture, continue processing until the dough comes together. Add milk if necessary. Shape the dough into a ball, wrap with plastic and refrigerate for about 30 minutes before using. On a lightly floured surface, roll out the dough into a large disk with 1/8-inch in thickness. 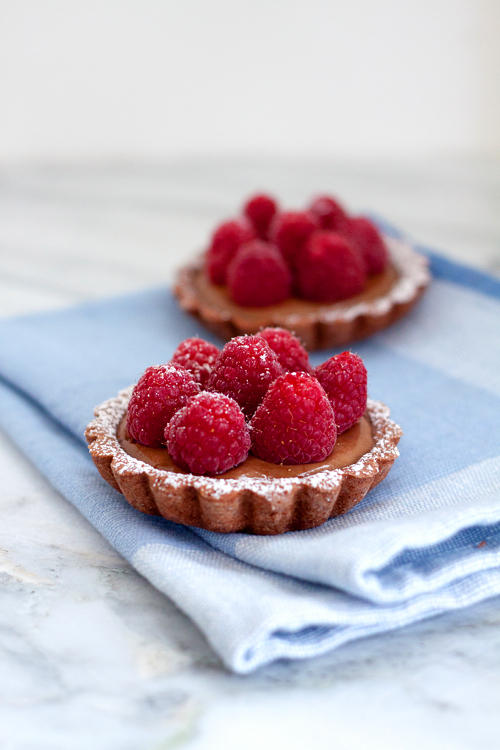 Use a large round cookie cutter, or a sharp knife to cut a circle about 1/2-1 inch larger than the diameter of your mini tartlet pan. Press the dough firmly and evenly across the bottom and up the sides of the pan. Cut the excess dough from the top sides of the pan using a sharp knife. Repeat the process with the remaining dough and tartlet pans. Usually you can get about 20-24 mini tartlets from one batch. 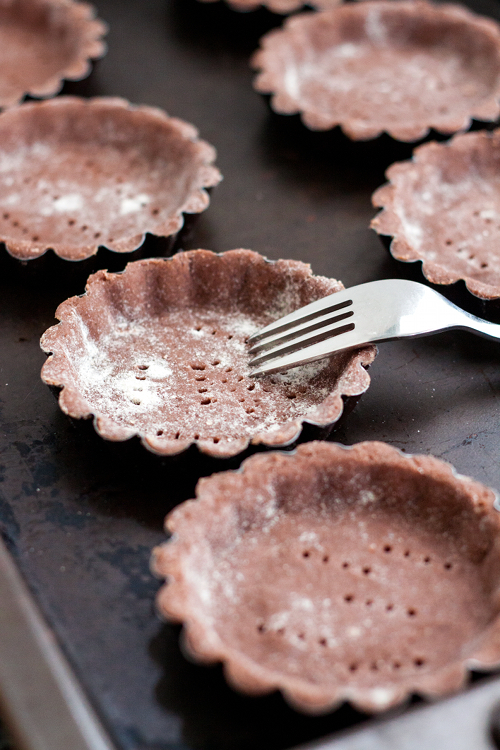 Using the tines of a fork, poke some holes on the bottom of the tartlets. Freeze the dough for about 30 minutes before baking. Preheat the oven to 350 F. Bake tartlet shells in the oven for about 10 minutes, or until cooked through. Transfer to wire rack to cool completely, remove shells from the pans. Set aside. To make the chocolate custard: In a medium saucepan, bring milk and vanilla into a boil. Turn off the heat and cool down slightly, about 10-15 minutes. In a mixing bowl, beat egg yolks, sugar, salt, and corn starch until creamy. Gradually stir in warm milk into egg mixture and continue beating until well incorporated. Return milk and egg mixture into the saucepan. Cook mixture over medium heat, whisking constantly, until the custard thickens. Add chocolate pieces, continue whisking until the chocolate melted completely. Remove saucepan from the heat, add butter and mix to blend. Transfer custard to a large bowl. Cover with plastic wrap, making sure that the wrap sits directly on the surface of the custard. This will prevent 'the skin' to form. Chill in the refrigerator. 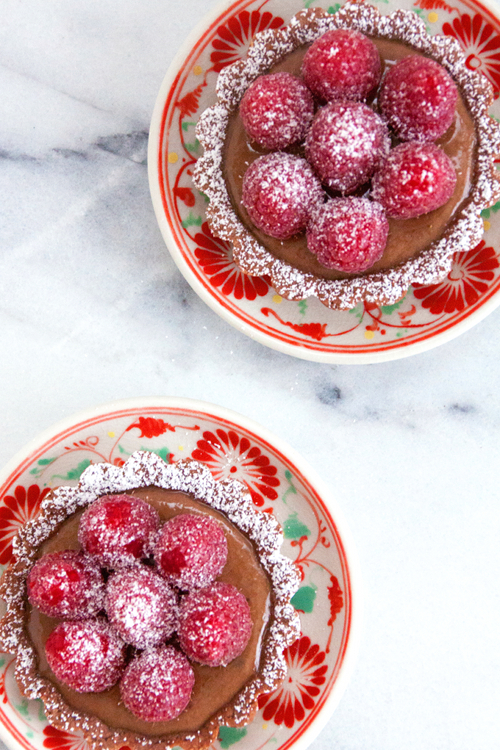 When ready to serve, fill each tartlet shell with chocolate custard. Arrange fresh raspberries over the custard and sprinkle some powdered sugar on top. The mini tarts looks so delicious~ Thank you for the recipe ^^ Gonna buy a pack of raspberries this afternoon.